Swansea City have added an aggressive edge to their game under manager Garry Monk, says defender Angel Rangel. The 2-0 win over Stoke cemented eighth place in the Premier League, which would be the club's highest finish. 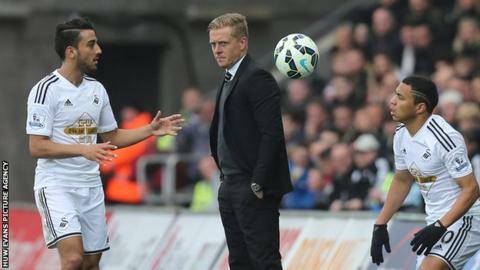 "Every manager is different, but we all know the Swansea way - possession," Angel said. "But Garry has introduced that attitude, that ugly side in a team, where probably you had to be more aggressive." Monk replaced Michael Laudrup in February 2014 and, after securing Premier League safety last season, has led them to greater heights this campaign. Jefferson Montero's first goal for the club and a strike from Ki Sung-Yueng also increased Swansea's Premier League club record points tally to 53 with three games left. The Welsh side had to dig in as Stoke attempted to get back on level terms, but Rangel says Swansea now have the physical and mental strength to win those battles. "Probably we would lose those games, but now we have both sides," said the Spaniard. "As a captain he [Monk] was pushing everyone on the pitch and as a manager he tries as hard, he tries to motivate everyone day-in, day-out in training. "I think you can see that in games if anyone is a bit switched off, at half-time he gives him a row and he's [the player] ready for the second half. "He's a young manager, like everyone he can still improve lots of things, but his management skills are very good. He's great, and as a coach everybody is happy." Saturday's win closed the gap with seventh-placed Southampton to four points, and put Swansea six points clear of West Ham and Stoke with three Premier League games left. "We were playing against a direct opponent - we were only three points from them - and beating them hopefully secures that eighth spot," Rangel added. "The commitment was there, the performance wasn't a 10, but it was enough to win 2-0 and I think everyone is happy with the record. "When you finish top eight the expectation for next season is higher, we know that, but we want to set a higher standard as well for ourselves. "Hopefully the club is ambitious enough and the players are ambitious enough, and together we can push for maybe higher ambitions, we can achieve something. "But at the moment top eight seems like a massive achievement for a club that a few years ago was in League One and the Championship."